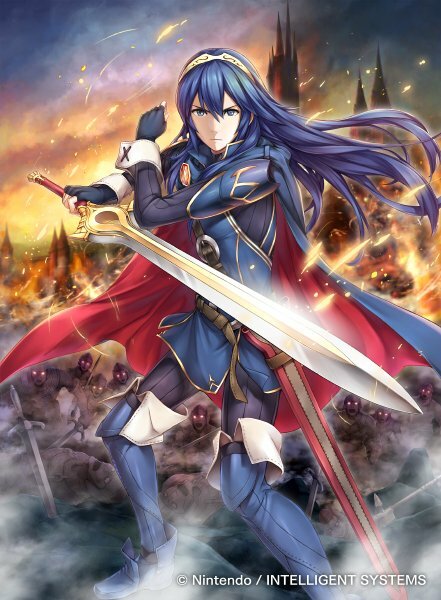 Cipher S14 Weekly Recap: Daily Reveals, Promo Art, & Site Update! 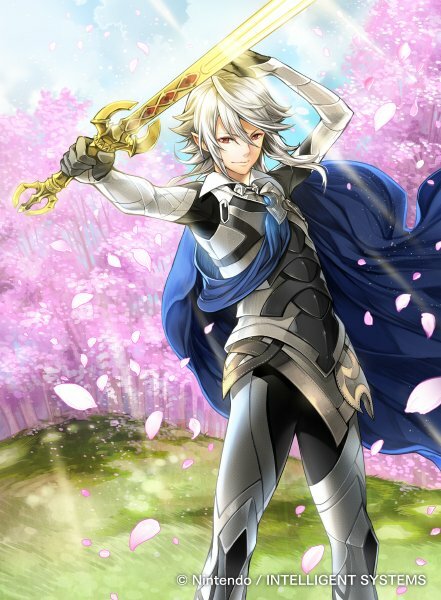 This week has brought fewer daily reveals than usual for Fire Emblem Cipher‘s S14. Likely this is a result of the recent earthquake in Hokkaido, which also delayed this week’s Nintendo Direct. Nonetheless, we do have a few reveals from earlier this week, including this triple card reveal for Tokyo Mirage Sessions #FE. The left card features Itsuki, the main character of TMS#FE. 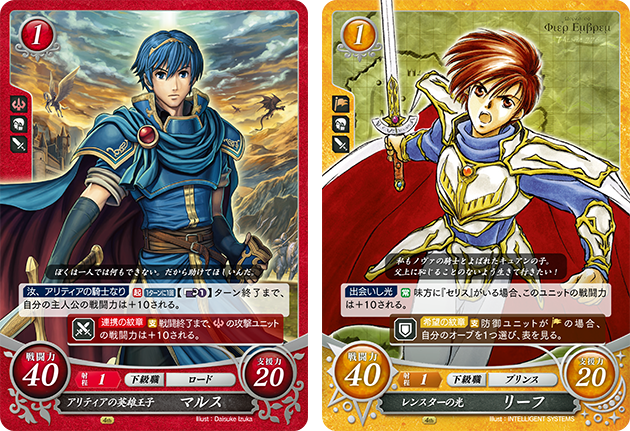 The middle and right cards are for the mirage version of Chrom. Even the aesthetics of the cards are reminiscent of the game’s unique style, especially the text quotes. 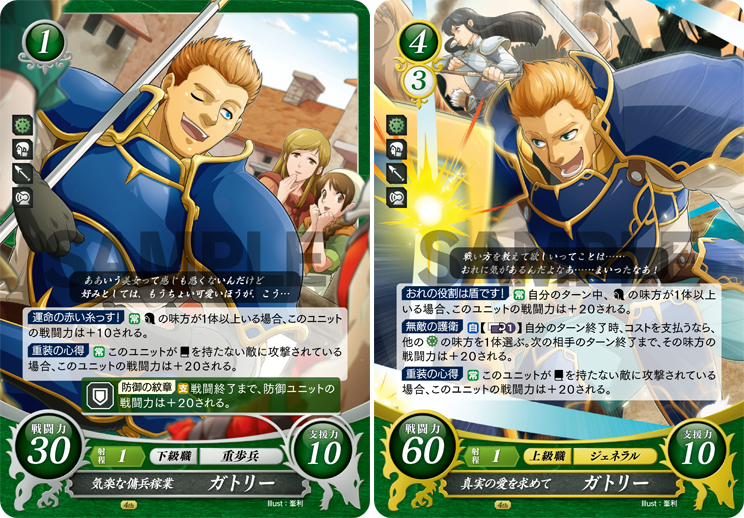 @fecipher also revealed a pair of cards each for both of the other focused titles. 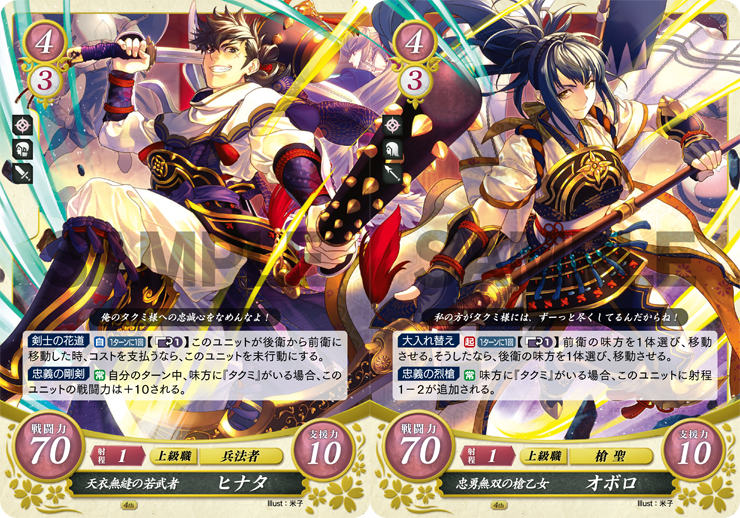 For Fates, Hinata and Oboro both appear in a gorgeous joined-art. Gatrie also arrives to represent Tellius, getting his first R foil card. Additionally, TCG shop Grand Panda Canyon (@Akibagrapan) recently revealed some promotional text-free art for S14! 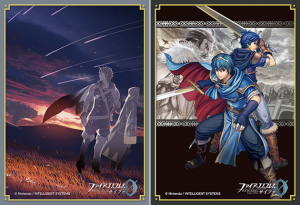 The art features the main lords of each portion of the set: Ike, Lucina, and Male Corrin. Furthermore, Cipher updated their official site recently with some new information about the set. 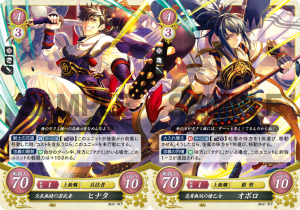 A small card preview includes a previously-unseen Cost 1 card for Takumi. We also get our first look at the S14 booster box goodies. 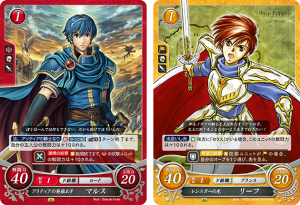 Marth and Leif are the S15 preview promos, both cards using their official art. 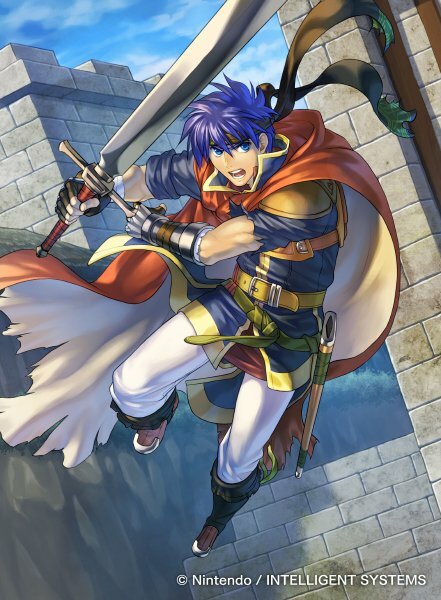 Marth’s card specifically uses his New Mystery art, as the red potion of the set focuses on the remake. This is also Leif’s first preview promo, as he did not get one during his first appearance back in S10. 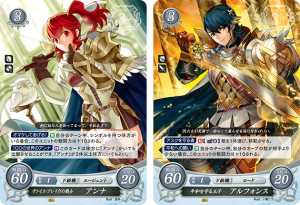 This set’s reprint promos feature Anna and Alfonse. Anna was originally a non-holo promo given out during various Cipher events in 2017 and 2018. Alfonse was a Dengeki Nintendo promo for their December 2017 issue. Both cards will now be reprinted in foil with a special 3rd Anniversary stamp in the upper right corner. Finally, we also get a look at the S14 promo sleeves. One features promotional Awakening artwork with Chrom and Robin. The other uses the box art for New Mystery. It’s unclear why they’re giving out New Mystery sleeves with this box rather than saving them for the New Mystery set. Cipher Series 14 will release later this month on 27 September! In the meantime, it’ll be an exciting month of news, reveals, and speculation. For further discussion about Cipher, feel free to join us in the Cipher subforum on the forums! You can also check out the Cipher Wiki for translations of the cards and more detailed information.